We are able to perform a wide range of routine, elective and emergency surgical procedures in our clinic. Occasionally your pet may need amore advanced surgical procedure, where referral to a specialist will be recommended. This is generally limited to complex orthopaedic procedures. 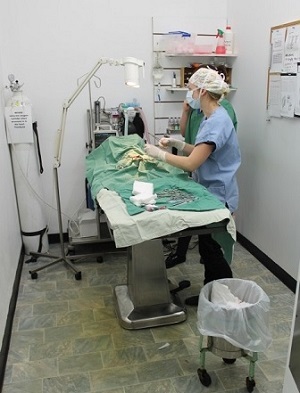 Surgery for your pet involves everything from preparation for surgery, right through to home care following surgery. In the clinic here, surgery involves premedication, anaesthesia and analgesia, surgery and recovery. Continue reading for more information on the processes relating to surgery within our clinic, or click on the links above for information on the things you can do for the process. Animals are premedicated prior to their anaesthetic and surgery. The purpose of this premedication is to provide analgesia (pain relief) prior to any surgical (painful) stimulation, and to provide sedative effects to the body so the body accommodates the anaesthetic more smoothly and easily. A full physical examination is performed on every patient prior to this premedication to assess the health of that patient at that particular point in time, and their suitability for the procedure to be undertaken. Your pet is anaesthetised by a veterinarian and assisted by a nurse. First, an intravenous (IV) catheter is placed, and the induction anaesthetic agent is administered into a vein. The pet is then intubated with an endotracheal tube (breathing tube), and connected to a gas anaesthetic machine. This gas machine will maintain your pet under anaesthetic for the duration of the procedure. A nurse monitors your pet under anaesthesia under the direct supervision of the operating vet. We have a number of monitors that are connected up to your pet while under anaesthesia, which help us to detect any changes in your pet. Your pet is NEVER left alone while under general anaesthesia, there is ALWAYS at least one person present at ALL times. Analgesia (pain relief) is initially provided within the premedication, as described above. Additional analgesia is sometimes administered during the procedure (eg local nerve blocks during dental procedures), and always administered after the procedure as a long acting pain relief injection (lasts for 24 hours). These different modes of analgesia allow your pet to have the most comfortable procedure as possible. Depending on the procedure, pain relief may be continued at home in the form of tablets or a liquid. This is generally the case for particularly painful procedures, or those with a lot of inflammation and swelling at the site of the surgery (eg an abscess). Spey (females) and castrate (males): This is the removal of the ovaries and uterus (spey), or removal of the testicles (castrate). These are the most common procedures we perform here. This is a day surgery. This is routine cleaning of the teeth, without any surgery (extractions or restorations) being performed. All dental procedures are performed under general anaesthesia. This is also a day surgery. This can involve anything from eye surgeries (eg entropion), upper airway surgery and orthopaedic surgeries. These procedures involve an initial consultation and discussion about the procedure. An estimation of cost can be provided at this consultation. The length of hospital stay will be dependent on the procedure performed. Emergency procedures are just that – emergencies. These are often related to trauma (eg being hit by cars and dog fights), or other causes, eg infection, internal bleeding, twisting gut and many more. These cases often involve a lot of medical and surgical care. After the procedure, patients are transferred to our recovery cages, where a nurse stays with them continuously until they are able to control their airways (breathing regularly and easily, and swallowing) and lift their head. They are then left to rest with plenty of warm bedding. They are monitored (during work hours) until they are discharged, usually that afternoon. You need to have a clear understanding of any medications that are required, as well as any special diet or exercise (or restriction of exercise!) requirements. If there are any problems relating to an anaesthetic or surgery, it is so important that you contact us immediately. There is a risk with EVERY anaesthetic and surgical procedure. This risk is low in young and healthy animals, and is increased in older animals, sick animals, debilitated animals, or animals with chronic disease (eg heart disease, kidney disease, diabetes, Cushings disease, etc.). Every animal has a pre-anaesthetic examination performed prior to anaesthetic, where we assess the individual patient’s anaesthetic risk, and we often identify some of these problems. We will often recommend pre-anaesthetic blood tests and other diagnostic tests which can further identify potential problems and risk factors prior to the anaesthetic. These tests are usually only recommended in the higher risk patients (older or sick). Despite the higher risk of anaesthetic complications in some of these patients, we rarely have catastrophic complications. We select drugs and dosages that are very safe for patients, and we continuously monitor the patient throughout the entire anaesthetic, so that any problems are identified immediately. Most of the time, the benefit of a particular procedure (eg a dental procedure to remove rotten and painful teeth in an old dog) far outweighs the risk of the anaesthetic. If you have any questions regarding a surgical or anaesthetic procedures, please do not hesitate to contact the clinic on 02 6884 9900.